2017 seems not to be on my side, after getting laid off, I just got another piece of information that our landlord would like us to move out. Why everything have to come at the same time? Well, we always should look into the bright side, but sometimes it’s a bit too much and hard to stay positive all the time. I will try but it’s a bit tough these days. I was busy with flat hunting this weekend and do not have much time to think about what to cook. So, I just come up with something very simple and healthy, in order to fit into our healthy theme lately. 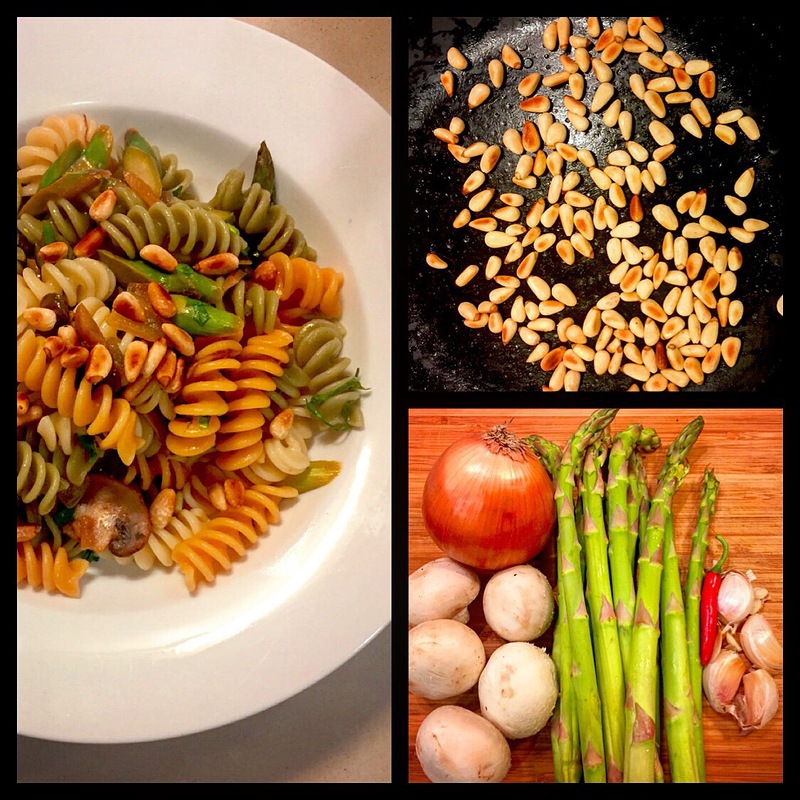 A vegetarian pasta – tri-colour fussili with asparagus and mushroom. The ingredients are very simple and of course based on vegetable, asparagus, mushroom and onion are the key ingredients and of course the tri-colour fussili. Bring a pot of hot water to boil and ready for the pasta. Heat up the pan with a touch of olive oil, then add sliced garlic and chopped onion in the pan, fry until the onion start to turn brown. Then, add the chopped red chilli pepper and mushroom, fry them and squeeze some lemon juice in. When the mushroom turned soft, add some white wine and cook a bit. Finally, add the chopped asparagus in, cook them a bit and then add a bit of salt. The sauce is basically ready and you can just add the pasta when they are done, don’t forget to add some chopped parsley. Mix the fussili pasta well together with the sauce, and serve them with some roasted pine nuts on top to add a touch of nutty texture. I found this pasta particularly light and healthy! You can also use this as a salad, chill them and then mix with some salad to eat as a pasta salad.